Many people use bad knees as an excuse to avoid exercise. Whether you have arthritis, a former injury or another condition that causes your knees to ache, there are steps and precautions you can take to make running on your knees as painless as possible. If you spend most of your time running on hard surfaces like concrete, you are placing extra stress on your knee joint that you can help to relieve by running on a softer surface. Softer surfaces, such as grass, dirt or wood chips, can help minimize the shock placed on your knees when you run -- many times high school and collegiate cross country races are held at golf courses for this purpose. You will want to make sure that the softer surface you are running on is still stable and firm, so you do not slip and cause further damage to your knees. Having a pair of running shoes that fit and have proper support can make a huge difference when running, especially when you have bad knees. Running shoes are designed to cushion your foot, which in turn takes stress off your knees. Most running shoes are designed to last for between 300 and 500 miles, which can come quickly if you are a consistent runner. The general guideline is to replace your shoes every six months, but that timeline may be accelerated if you run long distances almost every day. 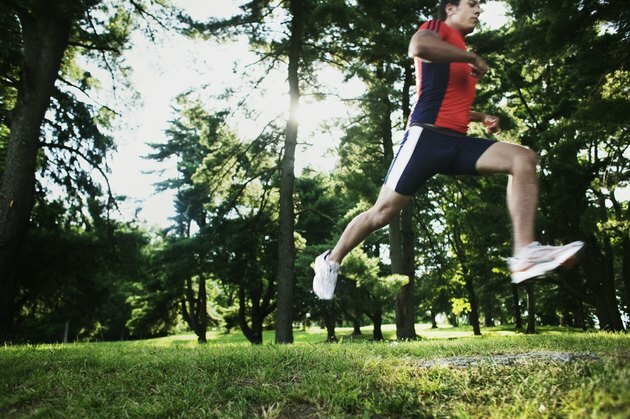 Proper form is an important aspect for all runners, but this is especially true if you have bad knees. Improper form can worsen your condition, while proper form can help minimize the discomfort you may experience when running. Make sure to have a bit of a forward lean when running, and keep your knees bent, which helps create a natural cushion in your knees when running. If you land with heel to toe motion rather than with flat feet, you will help minimize the impact as well. The longer you run, the more strain you place on your knees, so it's a good idea to take more breaks if you have bad knees. If your goal is to run for 60 minutes a day, try going for three 20-minute runs or four 15-minute runs. This will give you a chance to rest between runs while still getting your desired amount of running and cardiovascular work for the day. If you have bad knees, making sure your legs are stretched out before running is even more important than normal. Stretching your quadriceps, hamstrings and calves keep your knee joint flexible and avoids placing any extra pressure on your knee, and stretched-out muscles helps keep you from over-compensating for a tight muscle and placing extra stress on your knee.